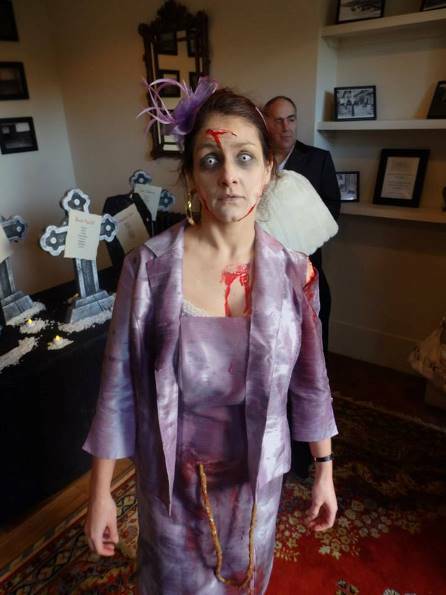 When I told a friend of mine that I was being paid to attend a horror themed wedding dressed as a zombie, he said that it sounded like, “a pretty fucked up wedding”. He was so wrong. 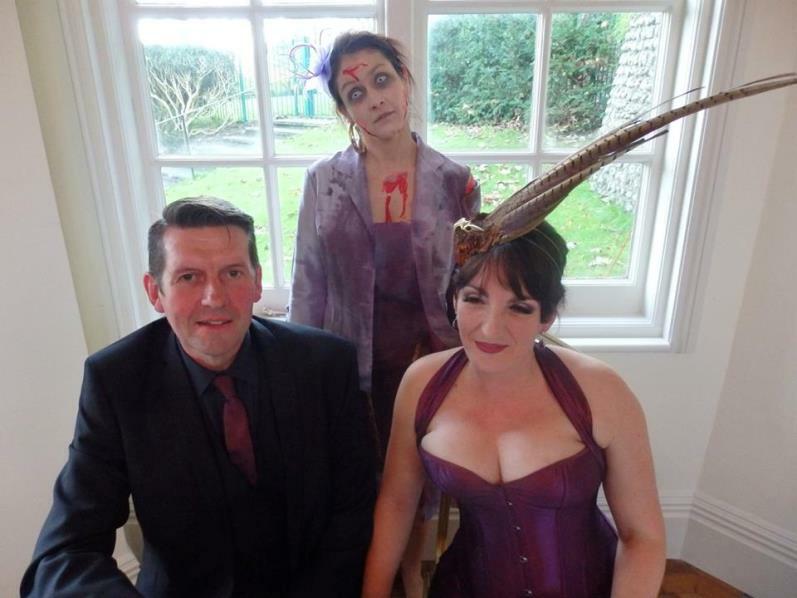 It all started when Sandra (Sandra Cheesman, the famous Eastbourne theatre director) said that some people she knew had asked her if she knew anyone who would turn up to their wedding as a zombie and entertain the guests. She said she did. With my permission, she passed them my number. A few weeks later, I was meeting up with this couple in a pub in Alfriston. While executed a ninja parking manoeuvre (with the help of my rear view camera) in the tiny narrow-streeted medieval village, I worried what these people would be like. I expected a very young goth couple who would be wearing all the gear. They weren’t like that at all. They were all in black, even the lovely dog was black, but they were very nice normal people and perhaps a little older than me. Explaining what they wanted, it sounded terrifying but pretty awesome. 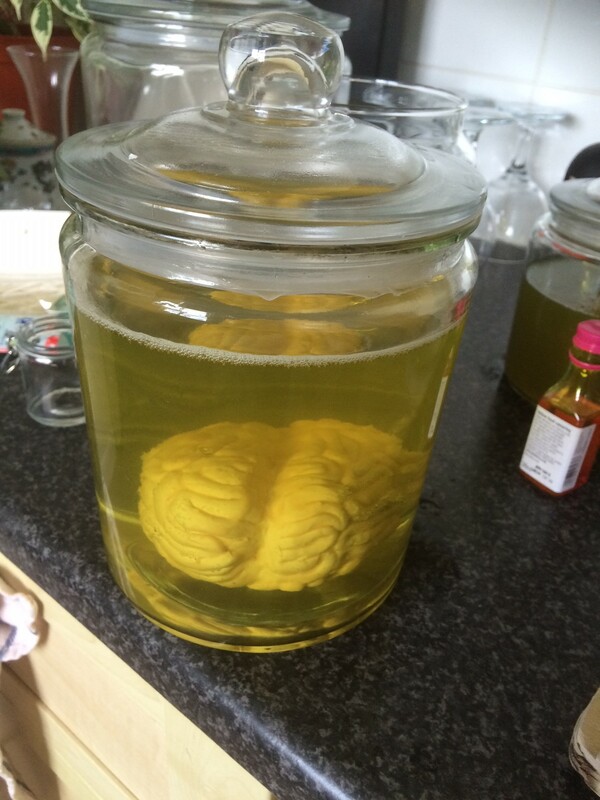 They also asked if I could make specimen jars to add to the decorations. Despite the fact that I’m dyspraxic and generally a bit retarded when it comes to making things with my hands, I said I’d give it a go. Fortunately, I make up in ingenuity what I lack in dexterity. Hence the jars looking pretty cool. The next challenge was the costumes. I decided that I was going to be a zombie during the day and a ghost in the evening. 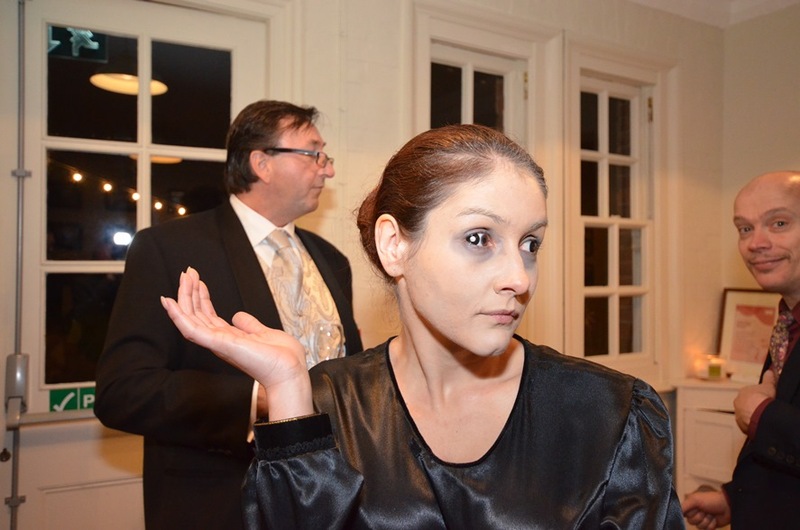 Cheating slightly, I borrowed the ‘ghost’ dress from Henfield Theatre Company. 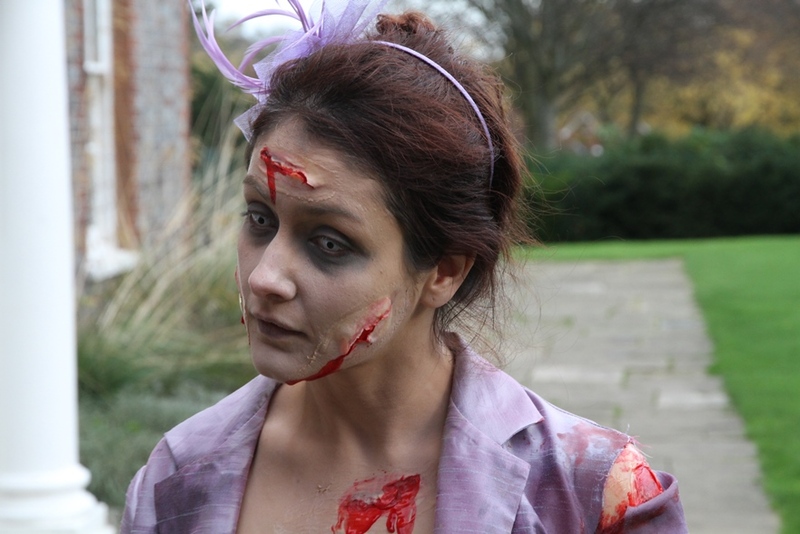 For the zombie outfit, I thought I’d go for a classic ‘wedding outfit’, with fascinator and all, but zombied up. As the big day grew closer, people kept asking me if I was nervous. I’d done similar things before like murder mysteries and auditioning for the Chamber of Horrors but never on my own. Yeah, I was really nervous. Driving to the venue on the day, I tried hard not to think about what was about to happen. The wedding was taking place in a beautiful Georgian manor house in Eastbourne. I was met at the door by a very efficient woman who directed me to the room where I was going to get all zombied up. As this outfit was ‘the big one’ really, it took me an hour and a half to get it looking the way I wanted. Layers and layers of liquid latex took ages to dry but were worth it. Walking down to meet the crowd was a bad moment. I felt a bit sick as I opened the door and zombie walked into the room full of people I didn’t know. The effect was exactly what I was looking for though. Some people did a double take. Some people stepped quickly aside to let me though. Some laughed. Others just stared. It was hard not to laugh myself. Before the ceremony started, I staggered around the room making silly comments like, “Oh my God, look at the state of my hair,” with blood running down my face from a big gash on my forehead. “I’ve got a bit of a stomach ache,” was another one, as I had guts hanging out. The ceremony itself was quick and felt very real, oddly enough. My cousins in Ireland have these big Catholic weddings that would be most women’s dream but, as I’m not religious, don’t really do it for me. This one, however, I thought was pretty cool. The bride was in purple with a fabulous peacock headpiece and the groom, who seemed so straight laced, got all choked up saying the vows. The lady who performed the ceremony was formal but warm and the whole thing just felt right to me. Just to make me super happy, they played Bach’s ‘Goldberg Variations’ while they were signing the register. I have this piece of music as my ringtone because it’s in Silence of the Lambs and would definitely be Hannibal Lecter’s ringtone if he had one. They even invited me to pose with them while they were having their picture taking with ‘the register’. 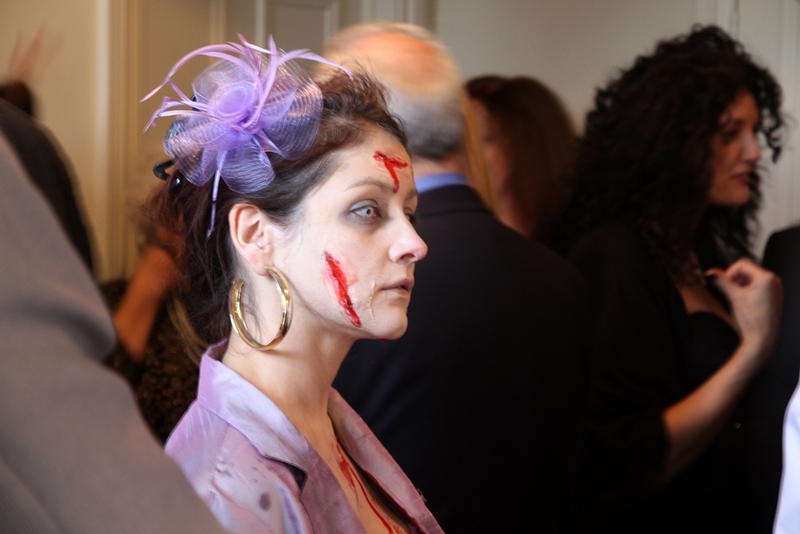 Once the ceremony was over, I started to feel that the zombie thing was getting old quickly. I changed into the ghost outfit and put in a pair of black contact lenses this time. Rather than staggering around trying to make people laugh, I went for the scares. As my outfit was partly inspired by The Woman in Black, I went for her technique. A ‘treasure hunt’ type activity was going on and not all the rooms were well lit. Standing completely still in darkened corners, I stared at people as they walked around. It took them a few minutes to spot me but when they did, they really jumped. In one instance, I stood under an archway while people were walking around and one woman actually let out a little scream. 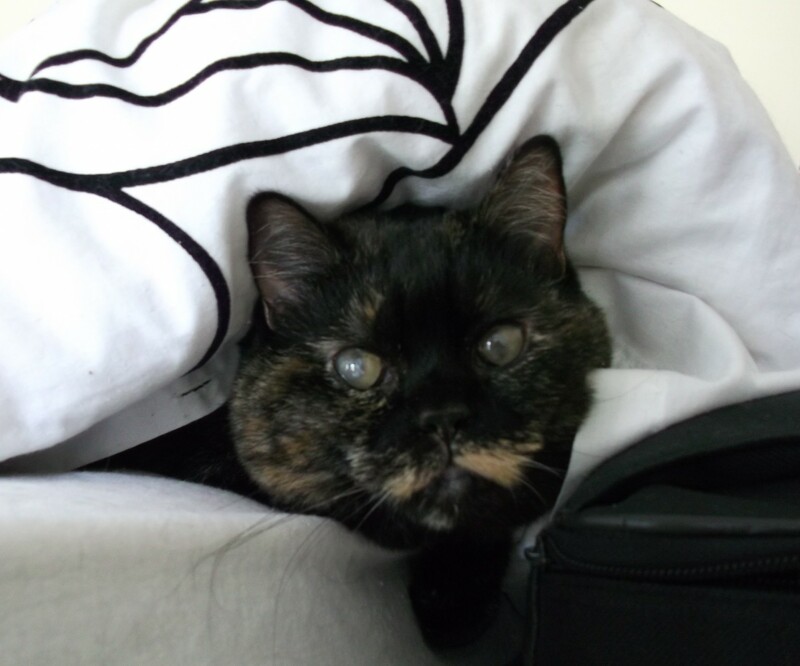 Later, she told me that I’d really scared her and that image of me in the archway was going to play on her mind. Moving my contact lenses across became my party piece. As the night wore on and I’d scared everyone I could, I let the persona go. 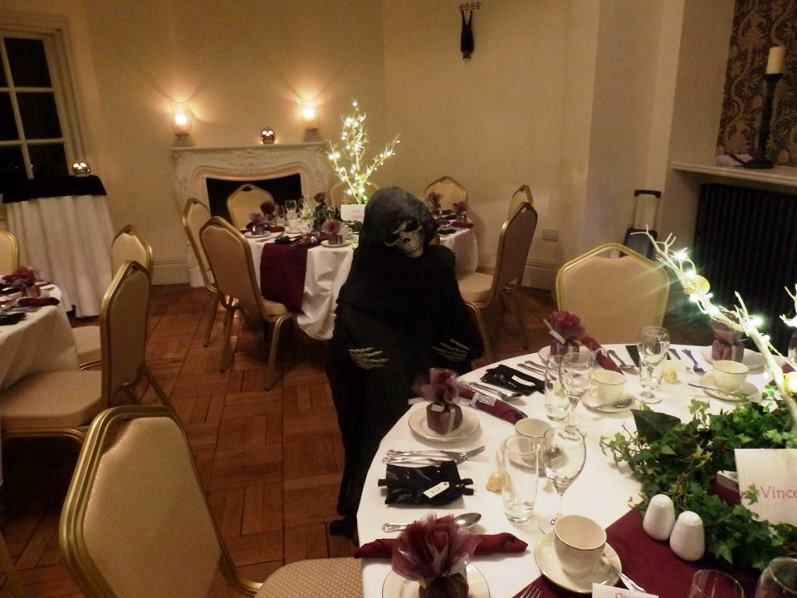 Still in my ghost outfit, I mingled with the guests and just chatted. Just before the meal, we were suddenly called into a room where ‘something had happened’. A dead body lay on the floor in a vampire costume with a stake in its chest. The murder mystery party had begun. 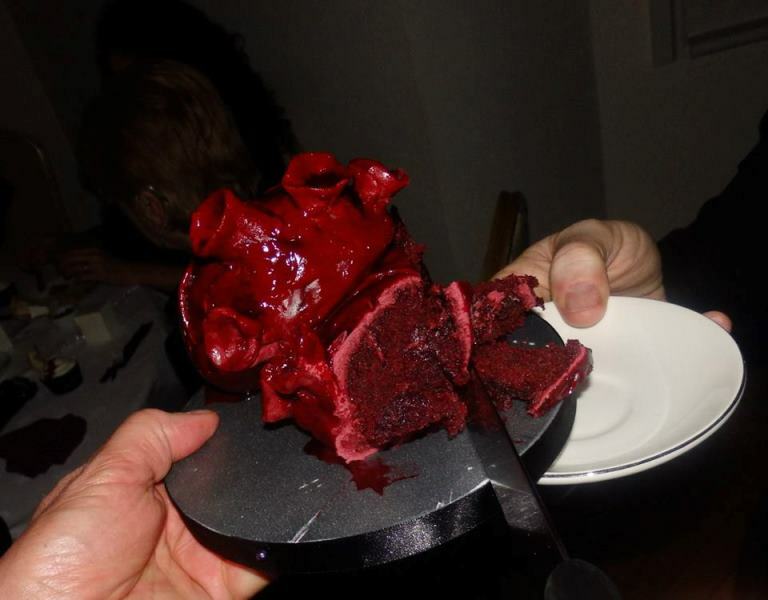 The cake consisted of two hearts and lots of cup cakes with pieces of glass sticking out. Going into the room for the meal, I loved the way the tables were laid out. They each had a cauldron with dry ice pouring out. The wedding favours were in mini body bags. 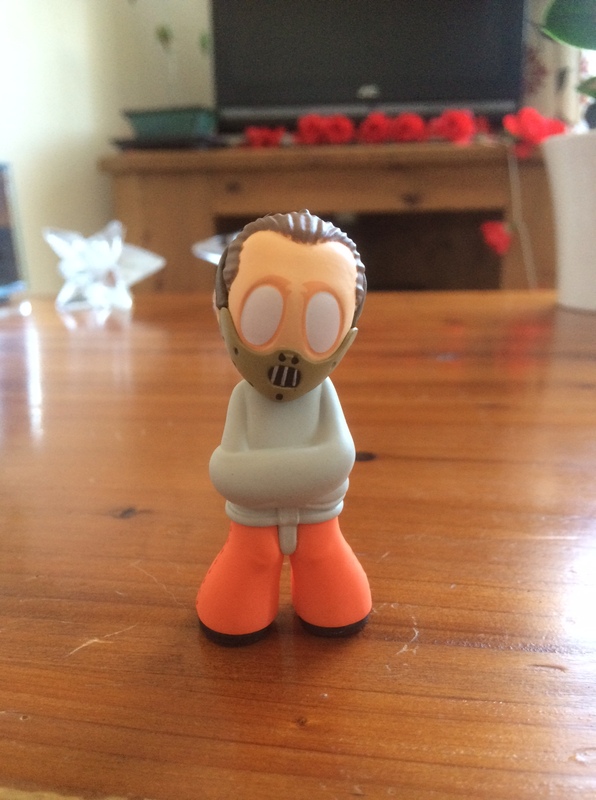 Opening mine, I was delighted to see that it was a figurine from a horror film. Everyone had different ones. I had Hannibal Lecter! I was so happy.